Performers include: Marla Gibbs, Hal Williams, Alaina Reed Hall, Helen Martin, Regina King, Curtis Baldwin, Jackée Harry, Barry Sobel, Paul Winfield, Toukie Smith, Stoney Jackson, Reynaldo Rey, Countess Vaughn, Kia Goodwin, and Kevin Peter Hall. TV show description: Marla Gibbs plays Mary Jenkins, a housewife living in Washington, D.C. She is known as a big gossip with a sardonic wit and lives in an apartment building with the address number of 227. Mary is married to Lester (Hal Williams), a construction worker with a college degree. Their teenage daughter is Brenda (Regina King), a very studious and hard-working young lady. She develops a crush on schoolmate and neighbor Calvin Dobbs (Curtis Baldwin) and they later begin dating. Alexandra DeWitt (Countess Vaughn) is an 11-year-old child prodigy and college student and moves in with the Jenkins as their houseguest for one year. The Jenkins’ neighbors and Mary’s closest friends are Pearl Shay and Rose Lee Holloway. 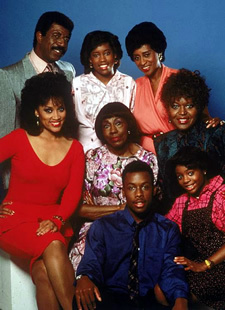 Pearl (Helen Martin) is an older woman that lives in the 227 building with her grandson, Calvin. She’s often heard to be the voice of reason and yet has the tendency to be somewhat of a snoop. Rose Lee (Alaina Reed) is a kind-hearted neighbor who later becomes the building landlord. She’s widowed with a daughter, Tiffany (Kia Goodwin), and later marries a police officer, Warren Merriwether (Kevin Peter Hall, Reed’s real-life husband). Eva Rawley (Toukie Smith), Dylan McMillan (Barry Sobel), Travis Filmore (Stoney Jackson), Warren Meriwether (Kevin Peter Hall), and Julian C. Barlow (Paul Winfield) join the cast in the show’s last season. Mary undergoes a Scrooge-like transformation in her attitude toward the homeless after a dream sequence shows her what it’s like to be on the street. She winds up meeting with Los Angeles homeless advocate Ted Hayes (playing himself) and encouraging Lester to hire several homeless men to work at his construction company. • The last episode was co-written by Gibbs. She got the idea for the story after watching a winter news broadcast about the frozen bodies of homeless people being picked up by sanitation workers. • Tensions between Gibbs and Harry peaked in season four. Harry was given a pilot for her own series but it didn’t become a series. She became a recurring special guest on 227 after that. • The show’s ratings had been in decline since season three. New castmembers were introduced in the fifth season but the changes didn’t revive the show’s popularity. It’s a pity the show was ended because they had a lot of fans. I am one of them. I haven’t missed a single episode.